This isn't the first time that this question has appeared in my mind out of the blue, but for every time that it has appeared, I have always managed to find an answer for it, and each time the answer that I get is always different from the previous ones as it comes from a different perspective. How many of you would agree with me on this? DISCLAIMER: EVERYTHING WRITTEN IN THIS BLOG ENTRY IS SOLELY BASED ON MY OWN OPINION, AND ACCORDING TO THE UNIVERSAL DECLARATION OF HUMAN RIGHTS BY THE UNITED NATIONS, I AM ENTITLED TO SPEAK/WRITE WHAT THAT PLEASES ME DUE TO MY RIGHT TO FREEDOM OF OPINION AND EXPRESSION, OR IF THAT DECLARATION IS INSUFFICIENT FOR YOU, THEN WE CAN GO BY THE ASEAN HUMAN RIGHTS DECLARATION UNDER THE SAME RIGHT TO FREEDOM. This is a review that has been requested by one of my blog readers. As most of you Instagram users who shop via IG, and look through the hashtag #lookingfor, this product is something that you would commonly see. A couple of months back... I purchased 4 pieces of this soap. Along with some slimming patches. I was warned that each piece of soap is smaller than the usual soap bar that you buy from your local supermarkets or retail outlets. However when I opened my parcel, I was stunned for a moment when I saw the size of my soap bars. The soap is about 2cm in height? So, that makes the dimension for each piece of soap to be 4.5(cm) by 4.5(cm) by 2(cm). I bet all of you are fishing for your ruler now to see exactly how long is 4.5cm and 2cm. Is this the expression on your face now? Well, that was my expression on my face. I guess my reason for my reaction was because for the past 20 years of my life, this was the MOST EXPENSIVE piece of soap bar that I have ever purchased and was going to use. That should be enough reason for that emotion, eh? I bet the question that popped into almost all (or perhaps ALL) of your minds when you saw this product is... "Does this really work???" Today, I will answer that question of yours, based on MY OWN EXPERIENCE and MY OWN OPINION. After I got over my shocked reaction, the next thought that crossed my mind was.. "If this soap is indeed effective, then why not?" Hence I used the soap dutifully for 2 months. For the first week, I used the soap and the slimming patch together, and yes I noticed some changes in my physical appearance.. I had slimmed down however I did not know what was causing it. Therefore I stopped using the patches and carried on with the soap. There were NO changes in my physique from then on, without the usage of the slimming patches. ".. help reduce cellulite on and around the waist, thigh and buttock area, giving a smooth, supple and toned appearance." For those who do not know what cellulite is, look at the example on the left. Based on my personal experience and my own observation of my own body, the last time that I checked (which is in fact, now) the cellulite marks around my inner thighs are still present and they look exactly the same as they did before I started using the slimming soap. Hmm.. I wonder why. Now, I will address another issue which is a question that has been asked pretty often..
"Is this product really from USA??" So yes, question answered. And now you know the answer. 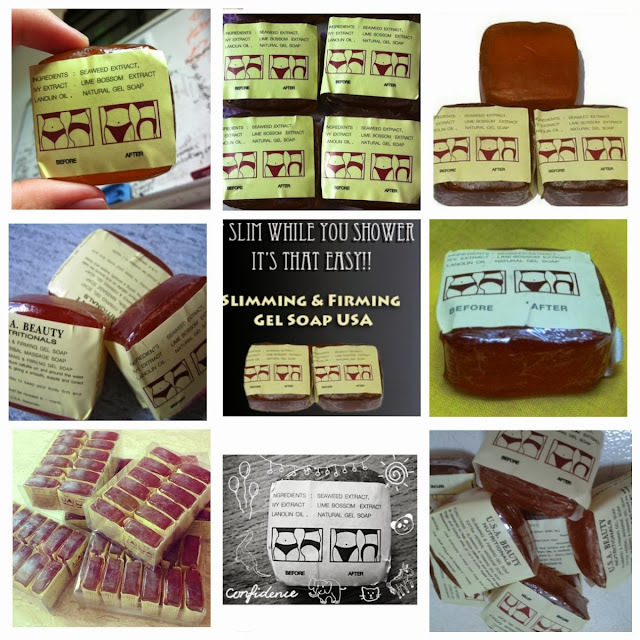 There have been feedbacks by people who have used the soap, that they have felt their skin tightening after using the soap. That is a sign of the slimming soap in action, isn't it? Today I will unravel the mystery for all of you. Seaweed extract: "Brown seaweed has been shown to cause cancerous tumors to self-destruct… detoxify the body of chemical build-up… and also burn body fat." Ivy extract: "(Ivy extract) is reported to tone and tighten the skin, while assisting in the removal of waste products from the body. For this reason, you will find ivy extract almost always is a key ingredient in products that aim to reduce the appearance of cellulite or promote weight loss." Lime Blossom extract: The only explanation that I had as to why lime blossom extract was added as one of the ingredients of the soap, was its ability to relieve stress and anxiety due to its soothing properties. Lanolin oil: A brilliant moisturiser. Derived from grease extracted from sheep's wool. And I quote, "(Lanolin oil is) a semi-occlusive breathable barrier, so it protects and absorbs at the same time. And once it penetrates into the skin, it holds up to 400 times its weight in water, so it's a fantastic moisture reservoir for skin." So now, after loading you with the summarised version of the benefits of each of the ingredients, it is time for us to unravel the mystery question. "Why do people feel a tightening feeling after using the soap???" Answer: It is because of lanolin oil. Ha! I bet you weren't expecting that!! Don't worry, neither did I! From my research, I found out that when you moisturise your skin, because of the rehydration, it increases the elasticity of your skin and hence causing it to become tighter! The reason why ivy extract is not the answer although it helps in toning and tightening the skin is because it has to be used in the form of a lotion or ointment in order for the ivy extract to take effect. Now, back to the other 3 ingredients used to make the soap (ie. Seaweed extract, Ivy extract, Lime Blossom extract), you've read the benefits that they give and it sounds awesome, doesn't it? Well I'm afraid that I have another bombshell for you: the benefits can only be reaped BEST, IF they are in contact with your body via the right method. To reap the benefits of seaweed extract, it has to be consumed. To reap the benefits of ivy extract, it has to be applied topically (meaning: applied to a localized area of the body or to the surface of a body part) usually in the form of a cream, gel or spray. To reap the benefits of lime blossom extract, it has to be consumed either in the form of drugs or a cup of tea. After saying this, PLEASE DO NOT over-consume/over-apply these products just because of what you have just read. LIMIT is the way to go. "Honestly, it is not worthy at all getting this soap (each piece is priced at $5-8). I wouldn't deny about its moisturising purposes, however if you are really keen on looking for a product to moisturise your skin, why not invest the money in a proper moisturising soap and/or moisturising cream/lotion? It is easily available in the local pharmacies around your neighbourhood (such as Watsons, Guardian or Unity) or if not in your local supermarket! I do know of several brands that are available in these stores which are really good! In fact, some of them are great for people suffering from Eczema!! Next thing, I can't tell you that the soap will definitely not serve its purpose of slimming. From my analysis, it helps a person to slim down by detoxifying the body of bad products. What I can tell you though, is that out of 4 routes of administering a product into a person's body system, the topical route is the less effective one as there is little absorption of the product into the body system. The topical route is only effective when you are trying to cure a problem that is on the surface of your skin. Furthermore if you were to think about it, what is the point of using a product which you would.. It does not even make sense to begin with!" After all that has been said, I will once again state that everything written in this blog entry is based on my personal experience, my personal opinion and my research on the internet. It is to your discretion, as to whether you wish to purchase this slimming soap after having read this review. Also, if you have been a user of this soap and have indeed slimmed down after using this slimming soap, GOOD FOR YOU! P/S: Do you own a slimming patch and.. you think it works? Are you sure that it really works or is it just your mind playing tricks on you? Are you sure that the one you have in your hands right now is AUTHENTIC? 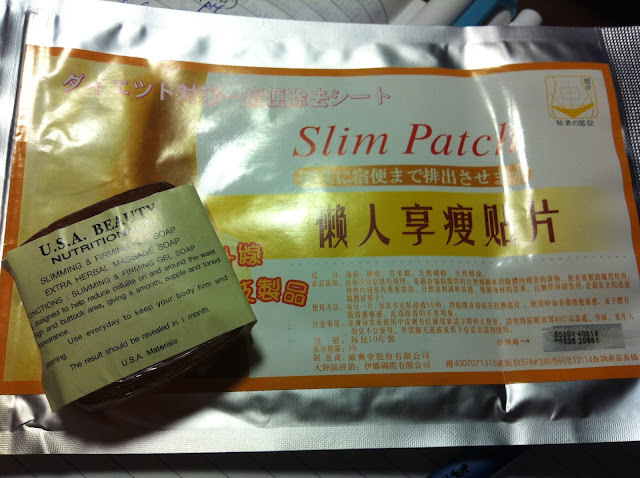 I have discovered fake slimming patches circulating around IG. More details on my next beauty blog review. Today this blog entry will simply be for me, because I have had a bad day. If by any chance that you happen to gain interest in or be inspired by what I am about to share, then all I can say that it has been my honour to have been able to share this with you. When I took this photo, my exams had just ended. I slept at 4am for the past 3 weeks as I was busy mugging for my papers! I hardly have acne problems nowadays but even if I do, it would mostly be tiny pimples about 1mm in diameter and on very rare occasions, pus-filled pimples. This is a common issue in Singapore due to our crazily humid weather and insanely stressful lifestyle (Hello to all the students reading this!)!! And the worst thing of all? PUBERTY!!!! Yes, I have little acne problems now (I have them because I sleep at crazy late timings which are really really bad! DO NOT BE LIKE ME!) but it hasn't always been like this for me. There was a time in my teenage years when I was plagued by acne issues as well! 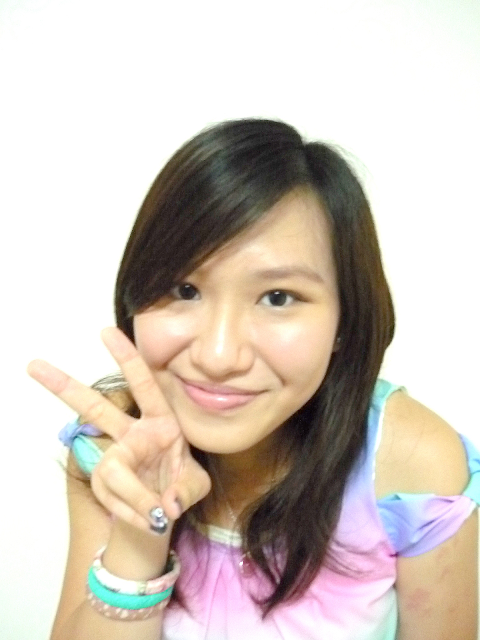 During that time, I dared not lift up my fringe as my forehead was covered with ugly pimples and the worst point of my acne problems was when a pimple chose to grow at the tip of my nose! YES, TIP OF MY NOSE. The tip of my nose would swell and be inflammed due to the pimple and so... I looked like Rudolph the Red Nose Reindeer! Anyway my point is, hang in there girls! That horrifying + irritating period WILL pass! Oh and, you girls are actually more lucky than I am! Ya know why?? Because back then, I had to wait out for my annoying acne period to end whereas NOW, you girls have a solution to your acne problems! I have to say this again, this is THE MOST AMAZING SOAP that I have ever seen & used in my life!!!! There is a tiny leaflet that was packed along with the soap into the plastic wrapper..
For those buyers who have purchased a Handmade Organic Soap before, I bet most of you simply flipped the small piece of paper into the dustbin without taking a second look at it, eh? After all, this whole thing is in Korean!!! HOW TO UNDERSTAND?!!! Well.. I am out to impress all of you today so here is a translation of what is written on that tiny piece of paper! Now, let me SHOW YOU how amazing this soap is! We all have pulsating zits at some point of our lives, and.. THIS IS MINE! The effect after just one wash was amazing! After a single wash, my pulsating pimple got reduced by 80% and the gooey painful disgusting pus, became just a small speck of white "thing"! I pressed on it lightly, it popped out from under the surface of my skin which I then flicked away easily! Usually a zit like that would take me 4-6 days to heal, but after using the Pearl soap, my pimples healed in about 2-3 days! That's half of the my usual recovery span!! Other than treating acne issues, the Handmade Organic Soap (Pearl) is also great for tightening pores, skin whitening and for removal of blackheads! 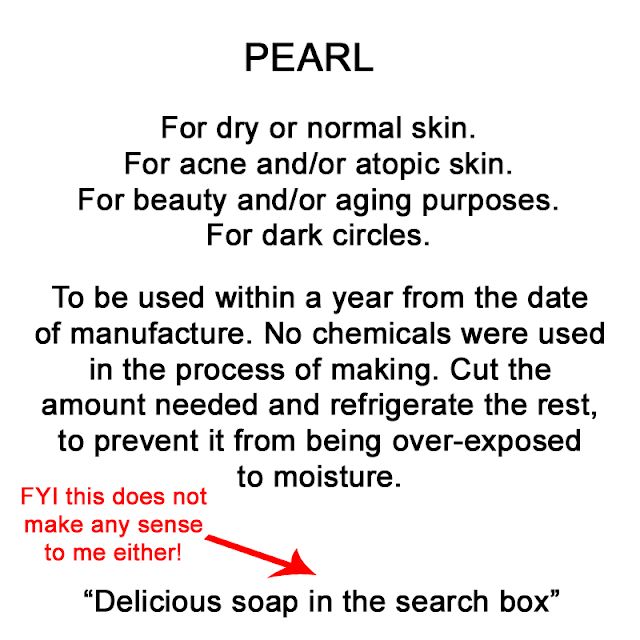 After using the Pearl soap, I witnessed my pores becoming significantly smaller and my blackheads have decreased as well! Another product which Queenie sent me for review was SHILLS Wow! Fluffy Fix Maximising Hair Volume Spray. .. who has fine and limp hair? Often getting frustrated and annoyed by hair thinning problems? 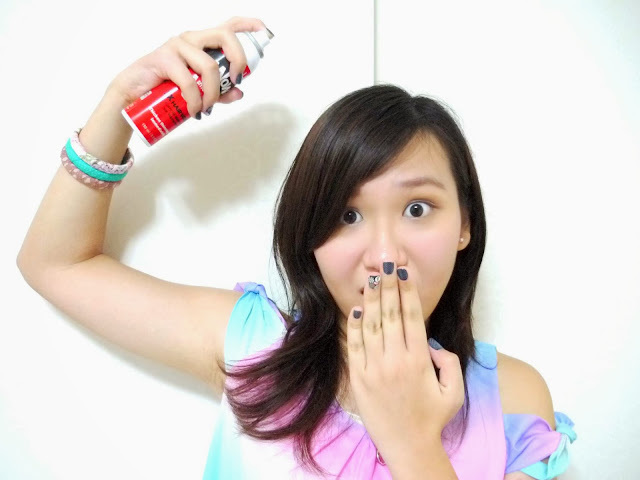 Or you urgently need a good volumising hair spray for volume up hairstyles? Introducing to you, SHILLS Wow! Fluffy Fix Maximising Hair Volume Spray! 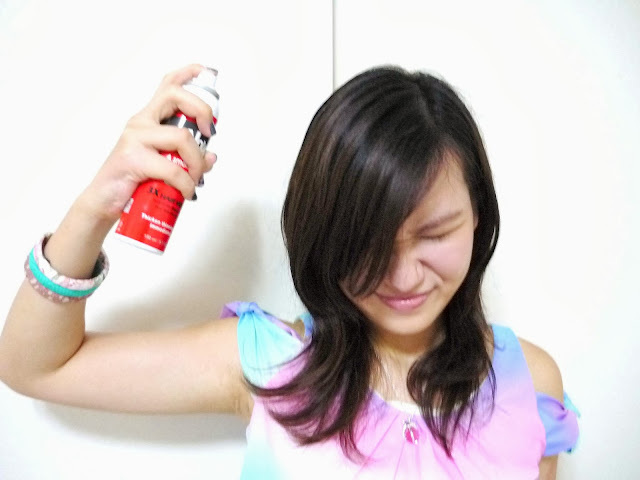 A volumizing spray for fine and limp hair. It can also be used for volume up hairstyles and it will last you all day long! Use it to create a THICK and FULL LOOK! It has a natural texture and a long-lasting hold. It can help you to achieve 3X your normal hair volume! It can also help to thicken thinning hair IMMEDIATELY! Hold the nozzle 10 cm away from the hair and... SPRAYYYYYYYYYYYYY!!!!!! And be greeted next by a WOW! hairstyle!!! THICK AND FULL! I own a rather satisfactory collection of nail polishes (at the moment) and I will squeal in excitement at the discovery of any new methods of nail art! Queenie surprised me with these 3 darlings in my parcel and needless to say, I was over the moon! These bottles of nail polish are really unique as they not only have a striper brush but they also have a detailing pen which is great for nail-art designing! This is how it looks like. Brush dipped in the bottle, detailing pen at the top. An actual photo of how it looks like. 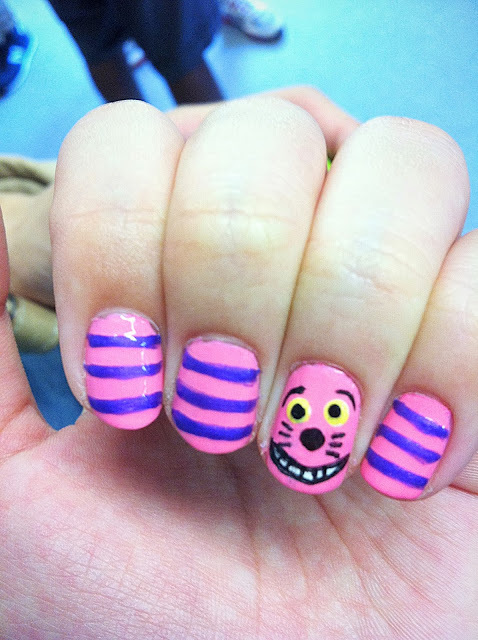 And so, using the purple striper, I did a nail art design of the Chesire Cat from Alice in Wonderland, inspired by cutepolish. I modified my design a little because I did not have purple flocking powder. 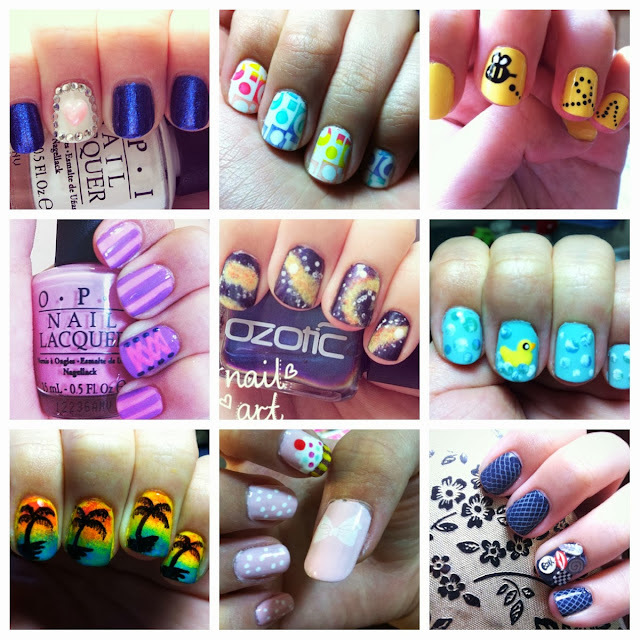 With the purple striper, this nail art design was so easy to be done! No squigly, wriggly, uneven lines! No alternating fat and thin stripes! YAY to pretty nails! Think any (or perhaps, ALL!) of these products are amazing and you want to get your hands on them? 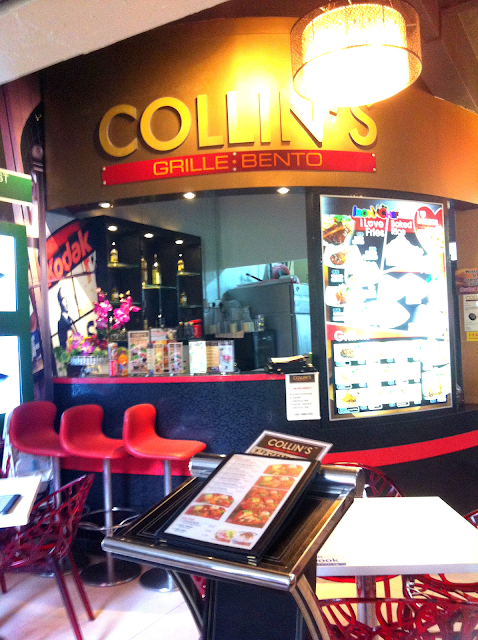 Collin's Grille.Bento serves both Western & Japanese cuisine and has 12 outlets throughout the whole of Singapore! For the Western cuisines, they offer the usual Western set meals such as chix chop, grilled steaks, grilled lamb chops, grilled fish and etc, and they also offer pastas and baked rice! 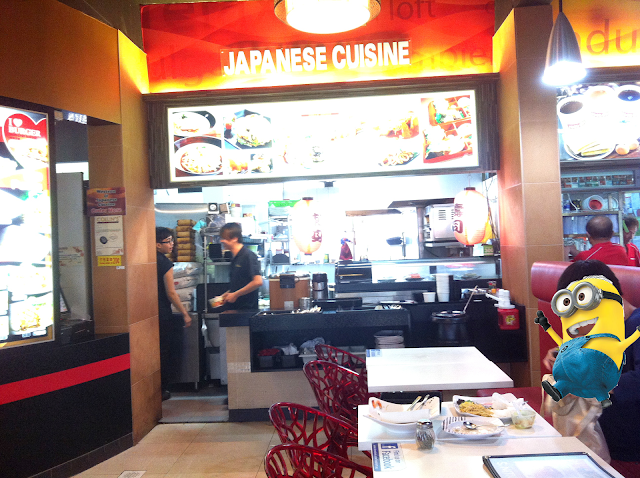 For the Japanese cuisines, Collin's offers bento set meals in Salmon, Saba, chicken teriyaki (and many other options), and in the menu, you can also find ramen and yaki meshi (fried rice)! Now that's a lot of options for a small food joint! I know what just crossed your mind... "With so many options available, most of the food would most definitely taste horrible.."
The outlet that I went to is the one at Woodlands, and yes it is situated in a coffee shop, where a part of the coffee shop is sectioned off just for the patrons of Collin's Grille.Bento! Collin's Grille.Bento is one of the few eateries that I have been to that offers great food at an unbelievably affordable price! Yay to cheap food! 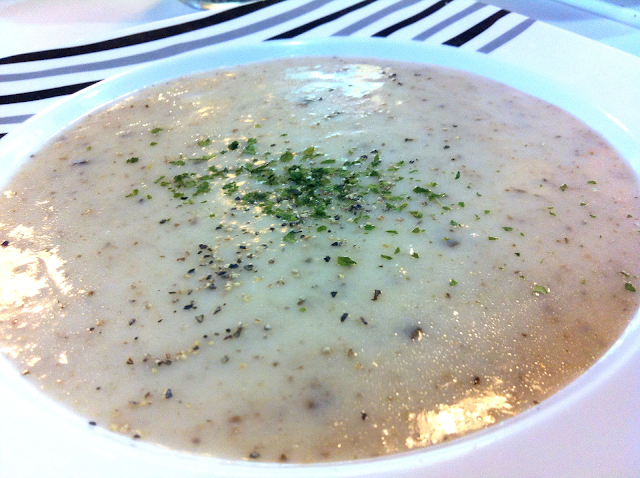 I have to say that this mushroom soup is rather ordinary. I would advocate for it to be (one of?) your appetiser, however when my soup arrived and after I took pictures of it (probably around 2-3 mins? ), the soup went cold already. I couldn't tell if the soup came cold or that it went cold because of the time that I took to snap shots of it, hence I dare not ask my server to bring it back into the kitchen to heat it up for me. So I had cold mushroom soup that day and although it was not horrible, it definitely took a couple of points off my rating chart. 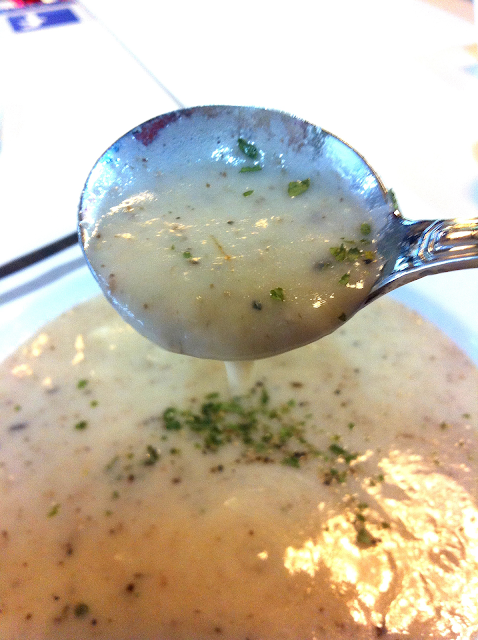 I would rate this mushroom soup 7.3/10. Aglio olio is a perfect choice for those days when you are craving for pasta and yet your taste buds aren't quite willing to accommodate savoury tastes! 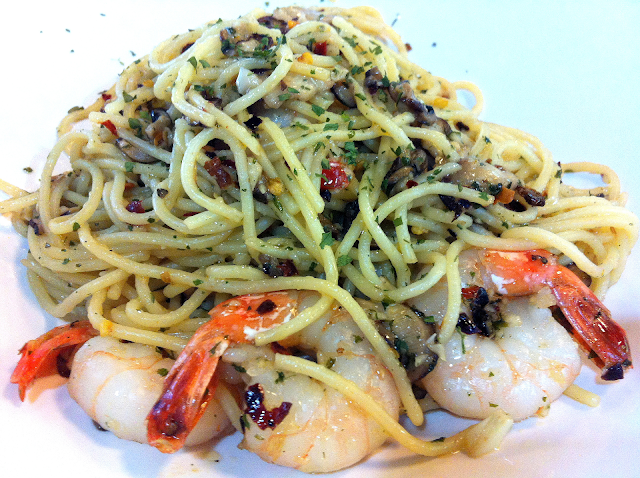 This Aglio Olio had the fragrance required for this dish which is made from the cooking oil, garlic, herbs and a tinge of chilli. 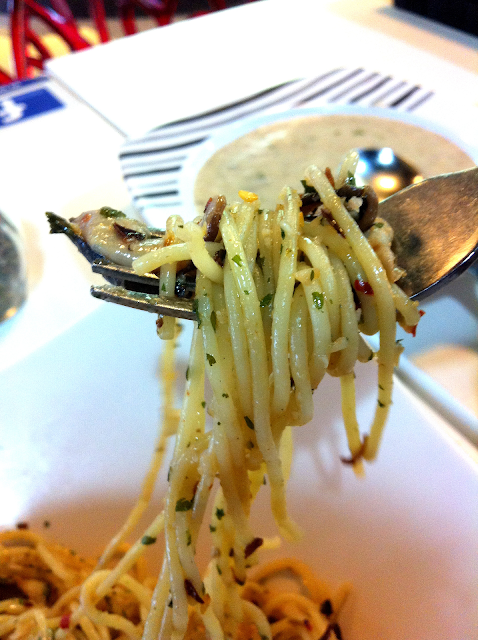 When eating this pasta, one will have the desire to take another bite after another and another. It is that addictive! As for the prawns, as seen from the picture, they were big, juiciy and succulent, and because they were stir fried together with the herbs and spices, it made the prawns even tastier! I would give this pasta a 7/10 because when I finished 80% of the pasta, I was disgusted by the pool of oil lying at the bottom of my plate, which the other 20% of my pasta was soaked in. Yuck. Oh well, the pasta tasted really really good though! I have to admit that this is the cheapest grilled salmon fillet that I have ever seen anywhere selling. 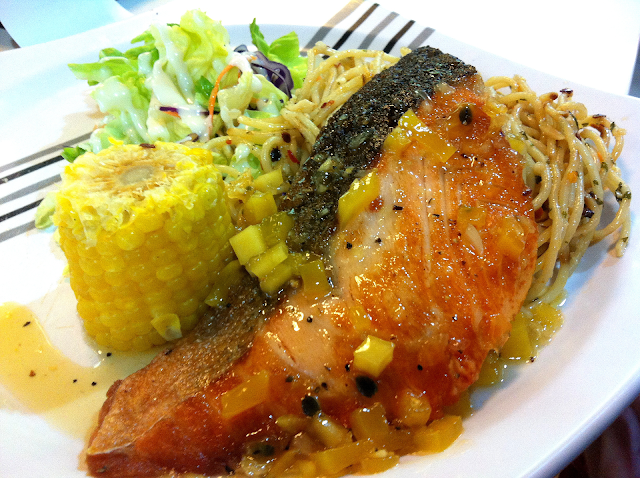 Not to mention, the generous portion of salmon fillet and sides provided (aglio olio, salad with some dressing and approx. 1/3 cob of corn), this is a guaranteed meal that will have you feeling full at the end of it! Tangy mango sauce with perfectly grilled salmon fillet? I give this dish 9.5/10! It not only tasted good but it was a total value for money! THUMBS UP! I would give these chipolatas 7/10? They are not as juicy as the ones I had at Marché but overall still pretty good. 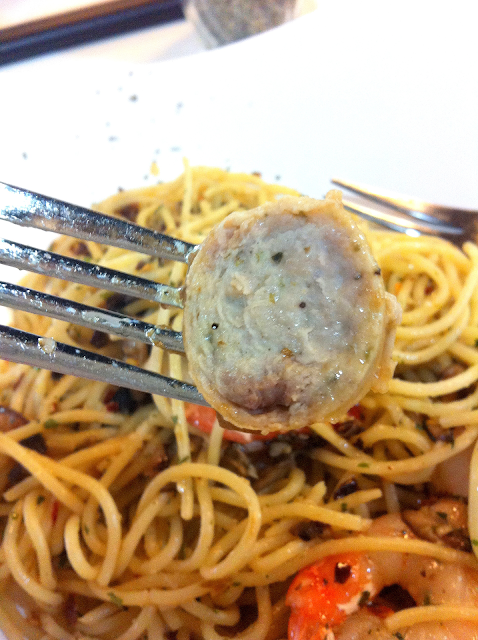 These chipolatas were grilled rather well, albeit it could have been a little juicier. 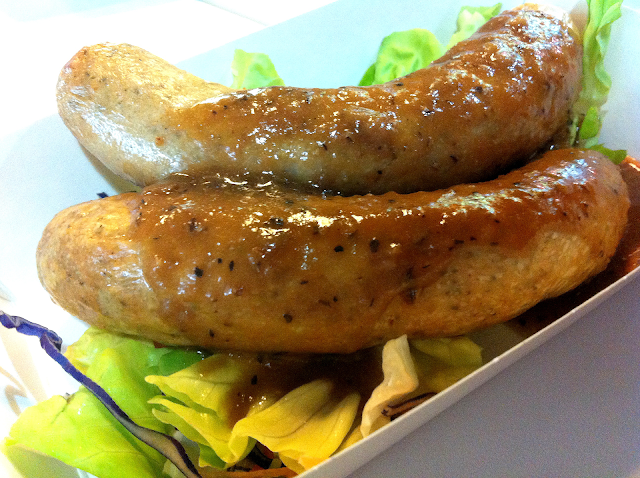 As for the the brown sauce that was drizzled over the chipolatas, it gave the sausages a more savoury flavour. Last but not least, dessert. If you are looking for something cold and something sweet (but not too sweet! ), this would be a perfect choice. The Green Tea ice-cream is great during those days when the weather is so freaking hot that you can literally fry an egg under the sun! 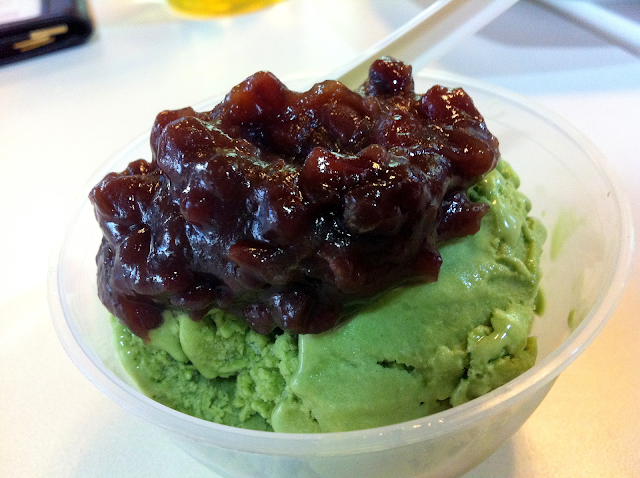 I found it rather interesting that when the Green Tea ice-cream was eaten with the Japanese Red Bean topping, the combination created a whole new sweet taste that was totally unlike eating just the Green Tea ice-cream alone! I give this dessert a 8.5/10! And that's a wrap for this food entry! Beauty products review coming up next!